Arcade Volleyball is volleyball game originally written by Rhett Anderson. 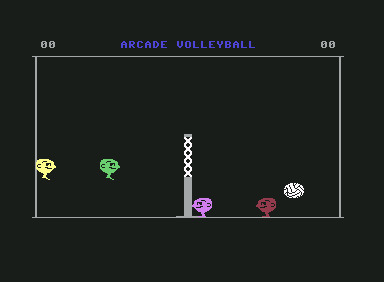 The game features teams of one or two players (depending on the platform) shaped like balls with legs who hit the volleyball with their heads. The game is played from a side-view perspective, and the ball can be bounced off of the walls and ceiling without penalty. Scoring is based on the original volleyball scoring rules, where only the serving team can score on each volley, and 15 points are required to win the game. The same head is permitted to hit the ball multiple times, but the team may only hit the ball three times while the ball is on their side.